The road starts here! Timeless H-D® products with captivating images. Seemingly endless vastness, breathtaking nature, unlimited freedom - the “American way of life” captivates millions. Few other brands represent this myth as original and unfiltered as Harley-Davidson. When Bill Harley and the three Davidson brothers Arthur, Walter and William built their first motor bikes in a small shed in Milwaukee in 1903, they probably did not know they were on the verge of creating a legend. In 1969 the brand reaches ultimate cult status due to the movie Easy Rider with Peter Fonda and Dennis Hopper. The two chopper-rebuilds, “Captain America” with its famous US paintwork and the consolidated “Billy Bike” decorated with flames, initiated a wave of individualization for Harley-Davidson owners that is still evident today. By the way, the bikes are solely manufactured in the USA. Promotional products have always been versatile. It started with billboards that increasingly paved the sidewalks in the late 19th century. Soon after, tins, clocks, thermometers and many other products followed. 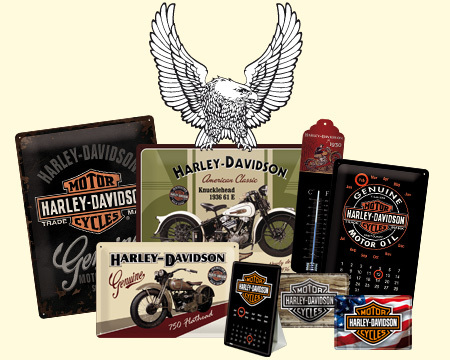 Therefore, you also find a variety of products with these beautiful H-D® promotional images, that so many people know and love in our assortment. Take time to look around! Here, we are happy to explain the characteristics of the various product groups. Check out our New H-D® Product line for Tin Thermometers, Tin Signs, Tin Boxes, and more! Visit Europe's One & Only Harley-Davidson® ROADHOUSE™ Collection showroom, or order online!